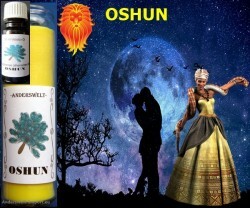 Voodoo Orisha Jar Candle Oshun. Oshun rules the sweet waters like streams, rivers and lakes. She is goddess of beauty, love, passion and sensuality, as well as money and wealth. Used for the following areas: love and romance, wealth, pregnancy, witchcraft or wishing magic, healing (especially emotional), beauty, weight loss.